It took two and a half years to produce. 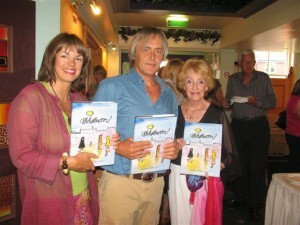 Now the book on the life of J Lawrence Isherwood has been launched. Steve Eckersley has never produced a book before. Now he is to be congratulated on his first work – which is the warts-and-all life story of Isherwood. Steve is an avid collector of the artist’s work, and it was after selling his business, and with time on his hands, he decided to tell the often controversial artist’s life-story in print and pictures. But the biggest plus in this book at the hundreds of colour photographs of Isherwood’s paintings. 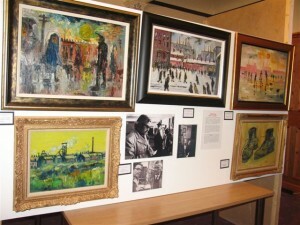 The launch took place at premises just off the East Lancashire Road at Golborne at which there were two exhibitions of the painter’s work – one was part of Steve’s personal collection. At the second, the paintings were for sale. Around 100 people turned up – and some remarked that it was a pity Isherwood hadn’t lived to see his life and work immortalised in the book. He died in the summer of 1989. The guest of honour was Molly Isherwood, the artist’s sister-in-law who, since his death, has worked long and hard to bring his work to public attention. In a short speech she thanked Steve and also mentioned the sad death of his brother, Vincent, who was responsible for 90 per cent of the design work before his untimely death. In the first section of the A4 size book, Steve, has crafted the ups and downs in the life of Jim Isherwood. It is a tale with many twists and turns. It is, at times, happy, sad and tragic. There are fascinating photographs – of Isherwood as a child, as a cobbler and as a painter and the pictures of a wide selection of paintings are superb. Framed Up Gallery, 834 Ormskirk Road, Pemberton, Wigan, Lancs. Wigan; Collect Art, 29 The Cross, Lymm, Cheshire. The Mill House Gallery, 1 Mill Lane, Parbold, Lancs. Colin de Rouffignac Antiques, 234 Almond Brook Road, Standish, Wigan, Lancs. Room Four Ltd., 58 Leigh Street, Golborne, Leigh, Lancs.